How can Academic Advising Help? 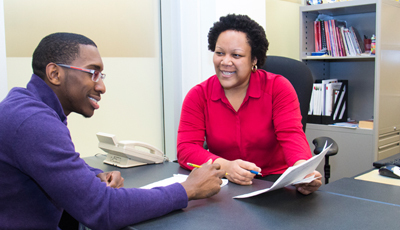 Academic Advising Services in the Faculty of Liberal Arts and Professional Studies (LA&PS) provides students with the information and guidance they need to succeed in their academic careers. Advisors can help students make the right academic decisions by explaining policies and regulations as well as presenting different options available to them in their studies. By speaking with an academic advisor, students can get answers to questions related to program selection, academic standing, petitions, grades and degree requirements. For questions related to a specific major, students should contact their major program office. Before you book an academic advising appointment, see these Frequently Asked Questions for the information you need. How can I speak with an Academic Advisor? Refer to the tabs below and click on your program. Students may be able to speak with an advisor on the spot (walk-in/drop-in), or they may need to book a future appointment. Advising for Undecided majors and majors not listed is offered in 103 Central Square. *Until 2:30pm (June to August). Please note: There are no evening appointments when classes are not in progress. Walk-in appointments are accommodated on a first-come, first-served basis. Please feel free to call us at 416-736-5210 to get an update on the status of walk-in appointments. Flexible times available. Advance booking required. Please call to book an appointment. Please email lapshuma@yorku.ca for an appointment. Flexible times available. Advance booking required. Book online. Drop-ins are not available at this time. Please schedule an appointment with us during the hours below. *Until 4:00pm (May 17, 2019 through to September 2, 2019). Due to the high volume of specific inquiries during the month of January, we are best able to serve our students with walk-ins on a first come, first serve basis. Booked appointments will not be available from January 3 – January 25, 2019, but will recommence on January 28, 2019.